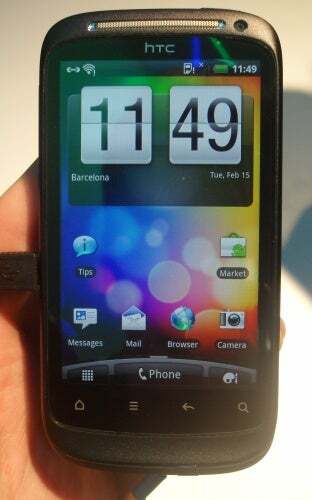 It was only a year ago when the original Desire made its appearance here in Barcelona at Mobile World Congress. I was impressed by its tough, yet sophisticated unibody aluminum design. The Desire S retains this build with a nice rounded shape that feels really good in hand. Unlike the Incredible S, the Desire S runs the latest version of Android, Gingerbread, which makes me happy. Like its predecessor, it is powered by a 1GHz Snapdragon processor. It has a bright, sharp 3.7-inch WVGA display. In my quick hands-on tests, the Desire S ran fluidly with no crashing or delays. The experience was pretty much on-par with the original desire but maybe slightly faster thanks to Android 2.3. One nice upgrade is that the Desire has both a front-facing and 5-megapixel back-facing camera (with 720p video capture). The Desire S, along with the Incredible S and the Wildfire S will be heading to Europe and Asia in Q2 2011. US availability, pricing or carriers has not been announced. Check back here for a video hands-on coming soon and see PCWorld's complete coverage of Mobile World Congress.